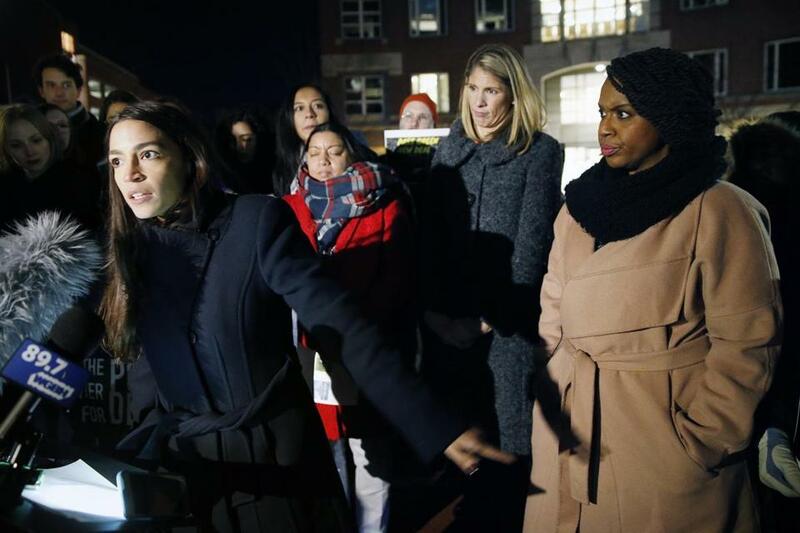 Representative-elect Alexandria Ocasio-Cortez of New York spoke at a small rally outside an orientation meeting for incoming members of Congress hosted by the Kennedy School at Harvard on Tuesday. CAMBRIDGE — If you’re going to be an outsider, sometimes you have to spend some time outside. And so, as an orientation program for new members of Congress was getting started inside Harvard’s Kennedy School on Tuesday night, Lori Trahan was shivering in the freezing cold. Ayanna Pressley stuffed her hands into her pockets. Someone offered Alexandria Ocasio-Cortez a hat. Flanked by a crowd of demonstrators chanting in support of universal health care and legislation to combat climate change, the soon-to-be lawmakers briefly abandoned the biennial program for newly elected members of Congress that was going on inside. Instead, some of the left’s rising stars — the first real glimmer of hope for progressive causes in about two years — staked out a strategy that doesn’t sound much like the bend-over-backwards-for-bipartisanship, please-sir-may-I-have-another Democrats who might as well have Republican footprints tattooed on their necks. “The people that elected me are looking for progress,” said Pressley, citing unabashedly liberal positions on health care and gun violence that plainly resonated with voters not just here but in districts all over the country. The result? A wave of Democratic victories that Pressley called a mandate for hope. The demonstration took place during an address by US Transportation Secretary Elaine Chao, and though organizers said it was not a specific protest of Chao or the event, the timing was stark. While the Kennedy School event has long been billed as a bipartisan exercise for members of both parties, the program featured several corporate CEOs and insiders from think tanks. The Center for Popular Democracy was offering what it called a people’s orientation that instead focused on reminding the newly elected officials whom they really work for. And Chao’s husband happens to be Senate majority leader Mitch McConnell, whose version of bipartisanship involves derailing a Supreme Court nomination on made-up grounds without so much as a hearing. Bipartisanship requires willing participants on both sides, but for too long the major parties have been playing by different rules. Even progressive priorities that large majorities of the country clearly support are shelved. The federal government still has not mustered the fortitude to pass a bump stock ban that would outlaw the kind of devices that allowed the man behind the Las Vegas massacre to turn his semi-automatic rifles into something approximating machine guns. But what kind of common ground can Congress find on gun violence when one side is so intractable? What does bipartisanship look like on, say, climate change when a huge swath of one party simply refuses to believe settled science? A lot of the electorate still fetishizes bipartisanship as if it’s some sort of panacea: If only the two parties could just work together, the thinking goes, maybe we’d solve real problems. And yet, it’s funny, we only started hearing about bipartisanship again about a month ago, when Democrats regained some measure of power in Washington. “We need to shake this nation awake,” said Ocasio-Cortez, a New York Democrat.